Running in Bogotá, Colombia. 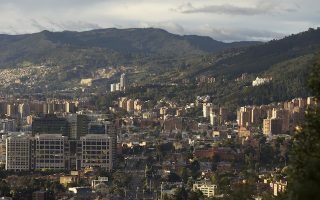 Best routes and places to run in Bogota. Bogotá is the capital and largest city in Colombia, perched 2,640 metres above sea level in the eastern cordillera of the Andes. 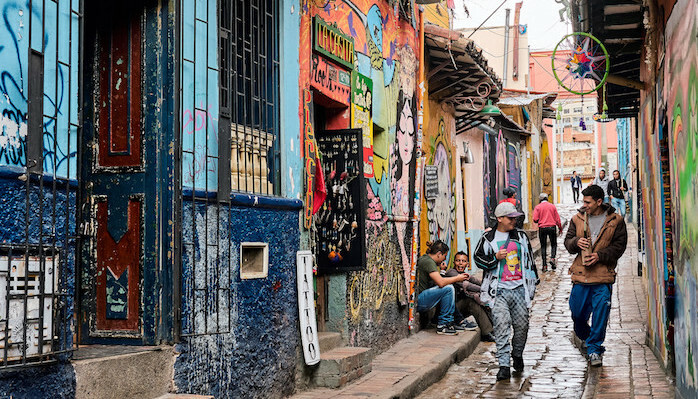 While it has always been Columbia’s domestic center of politics, economy, and culture, recent years have seen an explosion of international business, meetings, and tourism in Bogotá. 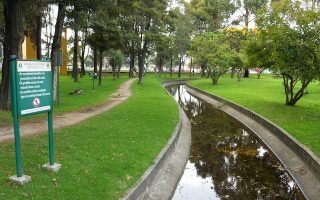 There is an emerging scene for running in Bogotá, though you do have to choose your spots, given the city’s congestion and lack of large-scale green space. In the past couple of decades, Bogotá has spent millions of dollars revitalizing public parks, streets, and bikeways — a boon to both local and visiting runners. City streets are somewhat cramped and smoggy for running, but with the continuous development of one of the largest cycling networks in the world, traffic and pollution are decreasing. Runners are welcome on bike paths at any time, and on Sundays and holidays from 7 am until 2 pm, they are free to use the 120 kms (76 miles) of select streets that are closed to vehicular traffic. Aside from those options, most runners flock to Bogotá’s city parks, many of which include jogger friendly tracks. Some local favorites include Parque Virrey, Parque Simon Bolivar, Parque Fontanar, and Parque San Andres. Note: Bogotá is at 8,661 feet, which can make it challenging for running. Be cautious and hydrate! The main method of public transportation in Bogotá is the TransMilenio, a citywide bus system that functions similarly to a subway service. While coverage is good, the routes are numerous, crowded, and somewhat confusing. A good alternative is to take advantage of Bogotá’s ciclorutas with a bike rental! 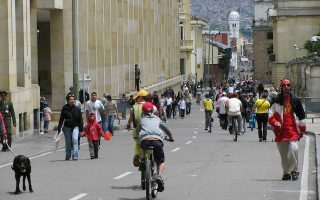 In an effort to promote citywide recreation, Bogota closes 76 miles of main streets to car traffic every Sunday and holiday from 7 am until 2 pm. We've recommended a few sections that are a particular treat to run. 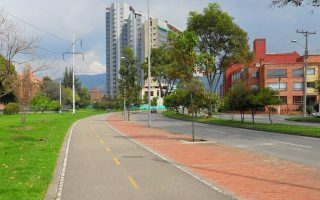 In recent years, Bogota has invested significant funds in the rehabilitation and reconstruction of public spaces, including over 300 km of runnable bike paths. These Ciclorutas offer a 'runnable' bike path from nearly anywhere in the city. 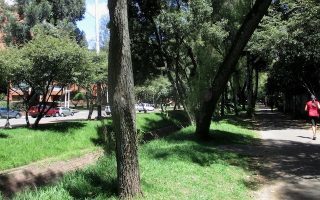 This narrow linear park between Calle 87 and Calle 89 in the Chapinero neighborhood of Bogota runs along the green El Virrey creek corridor. A full circuit is about 1.4 km (.8 miles). 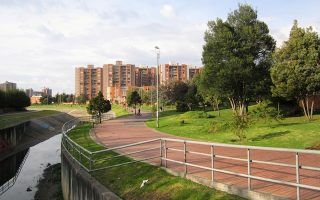 Parque Simón Bolívar is the largest, and usually the most crowded park in Bogota. It’s popular among runners for its large network of trails, ranging from hilly dirt trails to long paved flats. 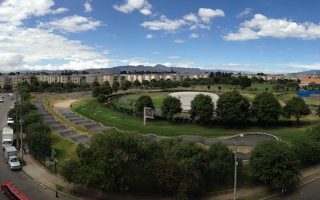 This community center in the Suba region of Bogota is relatively small, but it does have a 1 km (.6 miles) long designated jogging track. 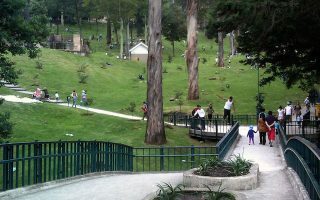 Another small but locally popular park, San Andres is a go-to exercise destination in the northwest of Bogota. Includes a .7 km (.4 miles) crushed rock jogging path. A hilly 6.4 km road run just outside Bogota, the ascenso de Patios is a favorite of locals seeking a longer run. Put in some laps of this 283 hectare green space consisting of gardens, playing fields, a famous Swiss Clock, and a section of the Arzobispo River. Bogota has a relatively uniform climate throughout the year. It never gets particularly hot or cold. Average high temperatures are in the 18-20C range (65-70F), and with nights in the 8-10C (45-50F) range. About 1,000mm (40 inches) of rain falls throughout the year, with some drier and wetter months. NOTE: There is fog on 2/3 of days, and very few clear days. Always bring a layer! With the growing running culture in Colombia, there are several running stores in the Bogota area. Running Balboa Colombia is a centrally located store, next to our Parque el Virrey route. There are also several outlets of the Fourpoint sporting goods store, which features a good selection of running gear. See our overview map. For all sorts of running info, ColombiaCorre.com is a great source. Runners can find a calendar of upcoming races throughout Colombia here.